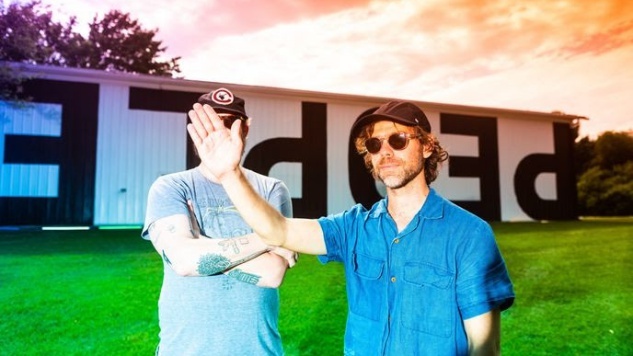 Collaborations between Justin Vernon (Bon Iver) and Aaron Dessner (The National) began in 2008, before the pair had even met in person—the result was “Big Red Machine,” a song that ended up on the compilation album Dark Was the Night, made in support of the fight against HIV/AIDS with the charity Red Hot Organization. What started as a song called “Big Red Machine” grew into a side project of the same name, and now, ten years later, Vernon and Dessner are putting out their ten-track debut under that name, the eponymous Big Red Machine, out Aug. 31. The record will include the four songs recently released by the band on major streaming platforms and will feature a number of collaborations from members of the PEOPLE art collective. You can see the full collaborative credits for the already-released tracks on PEOPLE, which is both an art collective and an artist-led, community-oriented sharing platform spearheaded by Vernon and Dessner. The album will be available on vinyl, cassette and CD in addition to all streaming services, including PEOPLE—which is where Big Red Machine’s four tracks were initially exclusively available. PEOPLE revolves around evolution and experimentation, and the collective is gathering in Berlin for a week-long residency on Aug. 12-19. On the 18th and 19th, visitors will be welcomed for two days of performances. “It’s about new material, collaborations, unique arrangements and dissolving borders,” PEOPLE said, describing the event. Find tickets and further details regarding the festival via PEOPLE. Get a taste of Big Red Machine below with their recording of “Lyla,” and the revisit the rest of their initial singles here. You can preorder their record here and find its tracklist further down below, along with Bon Iver and The National performances from the Paste archives.